NeoBokrug Elytis and I have been working hard on this project for the past couple of weeks, busy getting it up to speed both in terms of animations as well as making it feature-rich while still extremely script-efficient. 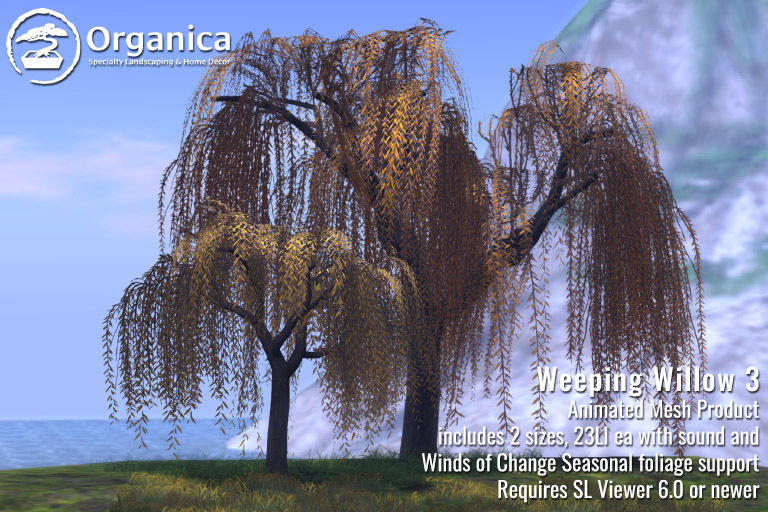 The Weeping Willows are the first in a line of trees from Organica that will both offer Animesh support as well as built-in compatibility with the Organica Seasonal Control Module, which will allow for mass foliage change of Organica: Winds of Change-compatible products both region-wide as well as parcel-specific. 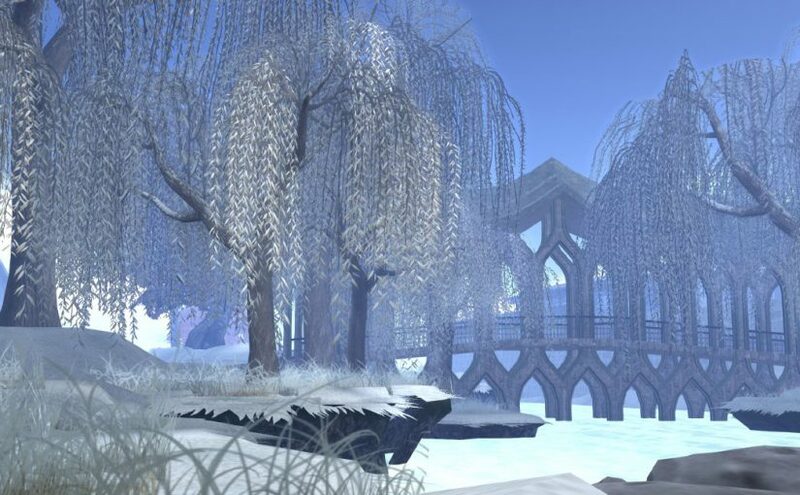 The Willows are set to animate and rustle in relation to Second Life region wind. They change texture (Spring, Summer, Fall, Winter, Dead) on command from the included SCM, but you can also set foliage by individual tree as well if you wish. All settings can be secured to owner, group or anyone. As an Animesh product, a compatible viewer must be used to view it properly. If your viewer has updated to 6.0 or better, you’re all set! Due to the nature of Animesh (it snaps back to the size defined by its armature and animations), only two sizes are currently offered and this tree cannot be resized. I’ll be doing some experimentation and hopefully more sizes will be available in the future – any additional sizes to this product will be sent as a free update. Due to a viewer bug (for which a solution is in the pipeline for release), shadows from this product are not currently cast properly. Keep an eye on JIRA BUG-202837 or at Content Creation User Group Meetings for movement on this problem – I will also announce once this issue has been fixed on the main viewer. The Weeping Willows are offered mod, copy, no transfer with copy-only scripts, animations and sounds and are optimized to 23LI each (Land-impact of future additional sizes may vary). Full documentation for use of the Organica Animesh Tree System available here. Special thanks to Aposiopesis Fullstop for her consultation on our documentation as well as the Residents of The Wastelands for being our guinea-pigs in our latter testing stage. You can pick up the Weeping Willow 3 pack, mod/copy object, copy-only contents, in-world here and on the Marketplace, here.